February 16, 2015 By Tina M 10 Comments This post may contain affiliate links. Read my disclosure policy here. I am already counting down the days to our Disneyland trip in a couple of months. I am so flippin’ excited. We went last year and I had no idea how much MORE FUN it would be now that I have kids. My last memory was going in high school. One of the best parts about our trip last year was going with my sister, who happens to be a Disney expert. She has had a season pass for the last 6+ years, and has been to Disneyland several hundred times! She knows all the ins and outs, and how to make the most of your time there. 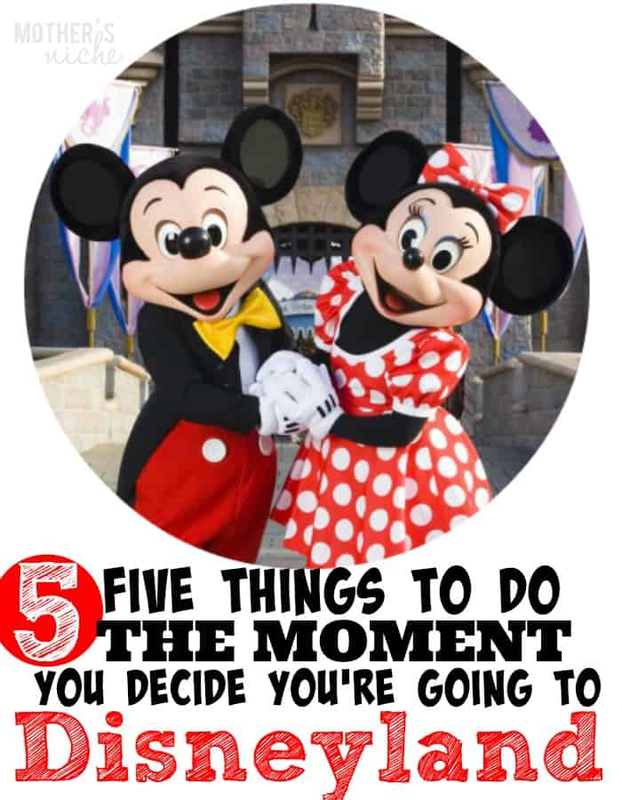 Today I wanted to share 5 things that you should start doing the moment you decide you are going to go to Disneyland! First off, congrats on making that decision! I’m here to confirm you have made the right choice 🙂 Magic is awaiting! 1. BOOK THROUGH A TRUSTED TRAVEL AGENT. 2. Start reading up on Disneyland tips. Trust me, you don’t want to just “wing it” when it comes to Disneyland. You want to have a plan. That will be the difference between a magical time and a not-so-magical time! A good place to start would be this article on Disney Tips, and then the others in this Disneyland travel series. Remember my mention of my sister who has been to Disneyland hundreds of times? She will be adding all her expert advice next week to the Disneyland Travel Series, so stay tuned for that! 3. Buy certain souvenirs ahead of time. This may not sound as fun as buying them in the park, but it will save you a LOT of money. If that doesn’t seem as magical, let your kids pick ONE thing from the park, and surprise them with other things each morning on their pillow. Surrounding grocery stores near the Disneyland resort are a great place to get T-shirts and other items for much cheaper than the Disneyland resort. If your kids want to do pin trading with the characters, you can buy used ones ahead of time for fairly cheap, and then trade them for better ones while you are at the park. More on that in my article 15 Things to Buy Before Your Trip to Disneyland. Start off by announcing the trip in a fun way. If you need some ideas, see this article on Fun Ways to Surprise Your Kids With a Trip to Disneyland. Build the excitement by providing your kids with fun ways to earn “Disney Bucks” that can be used on your trip. Not only does this benefit you (better behavior and more chores done), but it will save you MANY headaches at the park. Here’s why: Multiple families have expressed that this system keeps whining to a minimum. For the times that they didn’t do the “Disney Dollar” system, their kids begged all day for various souvenirs and treats at the parks. When they went with the “earned” Disney Bucks system, the kids knew ahead of time exactly how much they had to spend at the park. Instead of wanting everything they saw, they were very selective about what they bought because they wanted to make sure their hard-earned money went to the very best things! What are you serious?? You are so lucky! I wish I could go to Disneyland. When our family went to Florida for Disneyworld, we saved big on not having to buy all of our food when we got there because you never know how expensive it could be. So we like called these people that said they would buy all of our food for us and then once we reached our hotel, they would come by and deliver it to us. It was nice because it was about the same cost that we would usually use just to buy groceries at the store but without the driving and traveling. It was nice and I miss Florida a ton! I wish I could go and enjoy the warm weather there. BTW when you going? Then I can know when to start packing my bags! 🙂 jk. Haha I love you! Grocery service sounds awesome! We will have to try it this time 🙂 we are going after school gets out! I can’t wait until we finally get to go. I feel like we have been planning forever. We’re definitely doing the Disney Dollar thing. Love the ideas for the 15 things to buy before too- thanks! I totally agree about the souvenirs. They are so much cheaper outside the park! Thanks for the tips. Last year I was able to take three of my daughters to Disney World when we went to Florida for my brother’s wedding. It was amazing! Great tips. I wish we had known about the souvenir tips. GULP! It was a shocker for sure! How fun! Yes, souvenirs can run a pretty penny…we would much rather use it on the food! Did somebody say cream cheese filled pretzel?! For moms traveling visiting Disneyland with an infant or toddler, feel free to visit their Baby Care Center, located near the main park entrance. It is a quiet, little shop that has one or two cast members to assist you. You can change diapers, feed baby, take a little snooze. It’s really a wonderful resource. 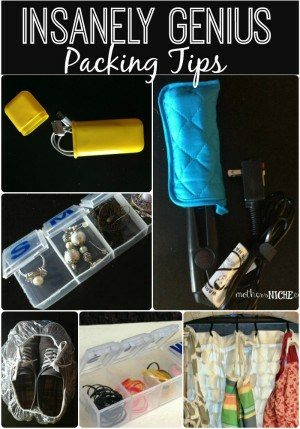 Travel kits are the best! We always do a binder full of printable and fun activity sheets to keep them busy, paired with a new set of colored pencils since we usually go places in the summer and don’t want melted crayons in the car. We also make sure to stop by the library before our trip to stock up on lots of books, especially if we’re road tripping it. I love your Disney tips! We have a trip coming up in March and I have been researching like a crazy person! I wanted to know if your MOTHERSNICHE code for Get Away Today was still active? And would it work towards the Southern California City Pass (which includes Disneyland)?